Twentieth Century Mexico has a remarkable artistic legacy, a legacy dominated by figuration. Gunther Gerzso is Mexico's great exception, an abstract artist of world stature. As early as 1948, Gerzso discovered a new pictorial space for abstract painting, one which acknowledged the flat, restricted space of Cubism, while at the same time exploring the endless vistas of late Surrealism. Despite his paintings intriguing affinities with European Modernism, Gerzso's work remains distinctly his own, a unique synthesis of geometric abstraction and the landscape, architecture, and poetry of pre-Columbian Mexico. 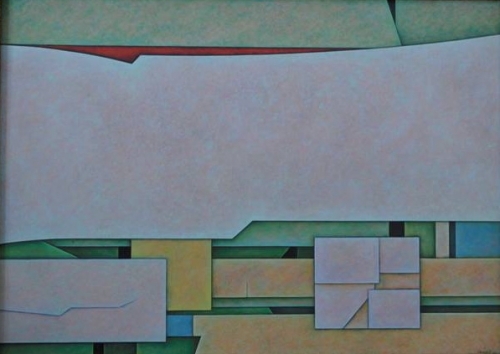 Gerzso's paintings appear as combinations of colored geometric planes or walls, layered one upon another. Broad surface areas, with textures modulated from scabrous to glass-smooth, are contrasted with recessed areas, suggesting an interior space beyond the field of vision. Gerzso uses architecture analogically and, as such, an opening is a passageway into both the body and the mind. Meticulously executed, his works are imbued in every detail with an approach to painting the artist refined over half a century. The formal perfection of Gerzso's abstractions suggests only one aspect of their power to engage the viewer, for they are at the same time highly personal, richly associative objects. Pre-Hispanic Mexico's architectural sites are made of cut stone. Their sharp silhouettes are a defining characteristic. Gerzso too, restricts his paintings to block-like configurations, each possessing the knife-edge of pre-Hispanic masonry. By identifying his paintings with Mexico's indigenous architecture, Gerzso asserts that, despite the influences of European culture, his is an artistic vision rooted in the Americas. Formal references to pre-Hispanic stone construction reflect the artist's admiration for the object well made, so finely conceived and executed, that it will resist the incursion of time. Stone is more than a building block, it is a primordial material, timeless and unyielding. With subtle mixtures of pigment and pumice, Gerzso's paintings have the uncanny feel of stone. The fixed density of stone is contrasted by his paintings rich color and texture: jungle greens, desert ochres, mineral blues; the varied imprints of rain, wind and sand. Beyond a formal enlivening of his composition, color and texture are reminders of nature's unremitting power to transform all things made by man. Despite being abstractions, Gerzso's paintings are landscapes, grounded in the vast and varied geography of Mexico. When read topographically, these paintings are about the abstraction of distance. Surfaces may appear to suggest jungles, high desert mesas, or bodies of water, but remain so far away that we are unable to make clear distinctions. The illusion of distance forces the viewer to use his or her imagination to complete the picture. Paradoxically, the same painting read conventionally, on a horizontal and vertical axis, can be seen as a close-up or detail of a much larger composition. This effect is reinforced by the way Gerzso crops his compositions to suggest their continuation beyond the frame line, by the artist's exquisite attention to detail, drawing the viewer into the nuances of glazing and surface texture, and also by the cellular divisions of form within the larger frame of the overall composition. In addition to delineating form, Gerzso's lines may float free, like lyrical accents or enigmatic mapping coordinates. They often appear back-lit, the area around them sanded smooth, thus highlighting their discrete presence in the overall composition. Line may also suggest incision or tearing, the violence of earthquakes or human aggression. However, it is Gerzso's curved lines which are most unexpected. With these he transforms landscape, creating the soft folds of love's secret places. Gerzso was a superb colorist, with a palette uniquely his own. He could, according to his desire, create greens which evoke the cool transparency of jade, cut so thin that light illumines its razor's edge, or the earthy, fecund greens of Mexico's Southern Lowlands. In one moment his oranges are tropical, warm and saturated with sunlight, in the next passage, they appear harsh and denatured, like the streetlights of urban Mexico City. Until his death at age eighty-five, Gerzso continued to make paintings that combined a highly developed sense of poetry, with steadfast pictorial exploration. In a country where pictorial traditions were defined by figuration, Gerzso dared to pursue abstraction. He created a world of painting from the metaphysics of stone, of pre-Columbian inspired geometry, and of landscapes, at once terrestrial and psychological. Upon first viewing, Gerzso's paintings may appear remote. They do not give up their secrets easily. However, with repeated viewing, they reveal a unique artistic presence: at once luminous, impermeable, and beyond the reach of time.